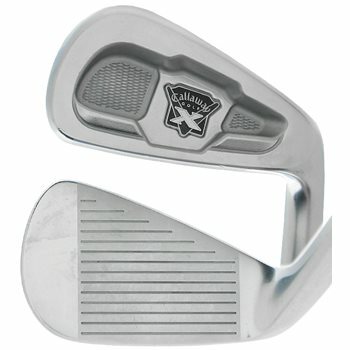 The Callaway X-Forged 2009 is forged from soft 1020 carbon steel and is a precision iron for highly skilled players. It features a short blade length, thin topline, and narrow sole for increased shot-making capability, along with a Flighted CG design that produces strong trajectories and Progressive Dual Notch Weighting that allows weight to be precisely positioned for optimal performance. By progressively adjusting the notch weighting through the set, it strategically adds more weight to shorter irons and removes weight from longer irons to produce strong, penetrating trajectories. The thin topline, shorter blade, and narrow sole create maximum workability while the White Chrome finish mutes glare. Forged 1020 Carbon Steel construction provides unmatched feel and performance for incredibly soft, responsive feel.